A few days ago we woke up to read the sad headlines of our (still) daily delivered Israeli newspaper. 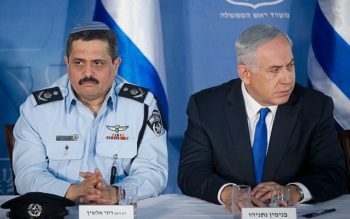 Israeli Police have officially recommended to the Attorney General that Prime Minister Netanyahu be criminally prosecuted for breach of trust, fraud and bribery. Attorney General Mandelblit must now decide if the PM will be indicted. His decision could take a year or longer, and could be followed by an appeal. Mr. Netanyahu is outwardly confident and has announced that he expect to complete his current term as PM, and even be re-elected. His coalition partners are mostly standing with him, keeping the government in place for now. However, public opinion is rapidly, and in many cases vehemently, turning against him. Many are demanding that he resign. The issue is sharply dividing our country. We believe that God raised up Mr. Netanyahu as the Israeli Prime Minister. But we do not know how long his term should or will continue. Our spirits are grieved for the condition of his heart, the heart of the nation, and most of all, the heart of God. Knowing that many international evangelicals hold Mr. Netanyahu in very high esteem, we ask you to bear in mind that sincere Israeli intercessors have been shown he is not without fault. He is merely a man, subject to extraordinary temptation. He has done tremendous good for Israel and the nations. But recall even Kings David and Solomon fell into serious sin. The Scriptures show that David, unlike Solomon, clearly repented. For years we have prayed for God’s gracious gift of repentance upon our prime minister. Will you please join us? Some important Scriptures to declare, with prayer points, are listed below. Though the matter is serious, we rejoice in hope, trusting YHVH, and knowing the Lion of Judah is in control. We encourage you to pray in faith, for God is good all the time. 1. Righteousness exalts a nation, but sin is a reproach to any people. (Proverbs 14:34) Ask God to graciously convict the PM, Attorney General Mandelbilt and other involved leaders that righteousness, truth, justice and integrity are of utmost importance to the blessing of Israel. When we dishonor God’s Word at the highest of government levels, reproach falls on the nation. He Himself is dishonored among the nations. 2. Who can tell if God will turn and relent, and turn away from His fierce anger, so that we may not perish? Then God saw their works, that they turned from their evil way; and God relented from the disaster that He had said He would bring upon them, and He did not do it. (Jonah 3:9-10)…God opposes the proud but gives grace to the humble. (James 4:6) Pray for a gift of repentance on the PM, that that if he is guilty of any wrongdoing, he would turn to God for mercy, justice, courage and wisdom. Pray for a personal revelation of God’s love for Mr. Netanyahu. His loving goodness leads to repentance. Revelation of the Most High leads to humility. 3. When evildoers advance against me to devour my flesh, when my enemies and my foes attack me, they will stumble and fall. (Psalm 27:2) Pray God would protect Netanyahu’s health physically, psychologically and spiritually from years of relentless personal attack. Pray he and his wife Sara would be protected from bitterness or arrogance of heart in this extremely trying time. 4. Do not turn me over to the desire of my foes, for false witnesses rise up against me, breathing out violence. (Psalm 27:12) Hide me from the conspiracy of the wicked, from that noisy crowd of evildoers…They encourage each other in evil plans, they talk about hiding their snares; they say, “Who will see them?” They plot injustice and say, “We have devised a perfect plan!” Surely the mind and heart of man are cunning. But God will shoot them with arrows; suddenly they will be struck down. He will turn their own tongues against them and bring them to ruin…(Psalm 64:2,5-8) Pray that God will expose and backfire all fake news, false allegations, globalist oriented conspiracies and hidden truths surrounding Netanyahu. 5. Plans fail for lack of counsel, but with many advisers they succeed. (Proverbs 15:22) Ask God to raise up trusted and righteous counselors to encourage and exhort Netanyahu according to His Word. 6. May all who hate Zion be turned back in shame. (Psalm 129:5) May God arise, may His enemies be scattered; may His foes flee before Him. (Psalm 68:1) Due to the current political crisis, our government is distracted from other critical matters, especially issues of security and defense. May God protect His people during this vulnerable time. May He remember His covenant with Israel and deal with His enemies who seek to upend her promised restoration. We ask for extraordinary grace to be on the prime minister to govern well and wisely during this time. 7. The Israelites did evil…they forgot the Lord their God…The anger of the Lord burned against Israel…But when they cried out to the Lord, He raised up for them a deliverer,… Caleb’s younger brother, who saved them. (Judges 3:7-11, see also Judges 3:15, 4:3-4, 6:7-12, 28) … He deposes kings and raises up others. (Daniel 2:21; see also Romans 13:1, John 19:11, Psalm 75:6-7, Daniel 4:17) Join us in asking God to prepare and raise up a leader who will act according to His purposes when He determines Netanyahu’s tenure is over. The preparation of a new, righteous leader is of utmost importance at this time. For an important post on this matter, please see https://lightofzion.org/prophetic-views/preparing-2018-everything-season-time-every-purpose-heaven-ecclesiastes-31/.